Win over your table with brussels sprouts cooked with bacon. Place the bacon and diced onions in a large skillet and cook over medium-high heat until bacon begins to brown and crisp. Add the sliced red cabbage and quartered brussels sprouts. 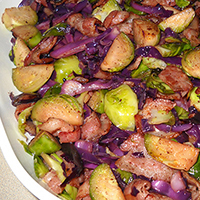 Cook for 12 to 15 minutes, stirring frequently until bacon is crisp and vegetables are cooked through (the cabbage will wilt and the brussels sprouts will begin to caramelize on the cut sides). Season with salt, pepper, nutmeg, and garlic powder. Serve and enjoy!